In the past, in mobile telecommunication business field Nokia and Microsoft were known as intensive competitors of each other. Nokia and Microsoft Software Company put people into shock after exposing that Nokia phones and Microsoft Corporation are putting their combine expertise’s together to create and develop new collaborated softwares together. Both together Nokia mobile (NOK) and Microsoft have introduced new Communicator mobile software. That Software enables the users to see their friends and colleagues availability and one can able to communicate with them through instant messenger, email, text or phone call. 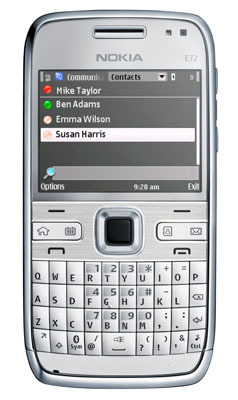 Users of Nokia N52 and Nokia E72 can download the software through Nokia’s Ovi Store. Details of the friends and colleagues that include their status and name will be automatically added in the mobile phones contact application. Microsoft’s office application will be embedded in the Nokia phones later this year. With the arrival of first collaborated software of both Nokia and Microsoft indicates that these two giant companies in future will launch more amazing and revolutionary software in the field of mobile technology. Latest Ovi Maps Racing Game.